Plus, Eeyore’s face cracks me up. It reminds me of my children’s face when I tell them no more television for the night because if I have to watch Spongebob fail another driver’s test, I might scream. Do you like Winnie the Pooh? If so, you’re in luck. DBA West/Partners Hub is giving away a DVD/Blu Ray Combo Pack! "Author A.A. Milne's beloved bear, Winnie the Pooh, joins forces with his friends from the Hundred Acre Wood to help two of their own in Disney's hand-drawn charmer. 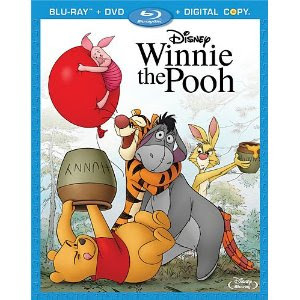 Though he describes himself as a "bear of very little brain," Pooh (Jim Cummings) proves he's all heart when sad-sack Eeyore's tail goes missing and a terrible creature called the "Backson" abducts Christopher Robin (Jack Boulter), their human protector (the schoolboy actually leaves a note saying he will be "back soon"). Granted, our hero spends the entire journey dreaming about glorious pots of "hunny," but when push comes to shove, he prioritizes his pals over his tummy, which rumbles and expands as his hunger pangs increase. Wisely, co-directors Don Hall and Stephen J. Anderson avoid the distraction of instantly recognizable actors in favor of animation veterans, like Tom Kenny (SpongeBob SquarePants), who voices the resourceful Rabbit. While Sebastian Cabot narrated the Winnie featurettes of yore, comedian John Cleese, who sometimes speaks directly to Pooh, ably steps into his shoes, and talk-show host Craig Ferguson also makes a mark as the know-it-all Owl. At 68 minutes, not including short film "The Ballad of Nessie," this John Lasseter-produced feature should captivate most young viewers, even those accustomed to faster-paced, computer-animated features, like Lasseter's directorial efforts for Pixar. Musician M. Ward and singer/actress Zooey Deschanel of the band She & Him add to the old-fashioned charm with their retro-sounding songs. And be sure to stay through the closing credits for the funny surprise at the end." For added information, check out this widget! Mandatory Entry: Who is your favorite Winnie the Pooh character and why? --Take the personality quiz in the widget and tell me what character it came up with! Please leave a separate comment for each entry and PLEASE have your e-mail linked up to your blog so I can contact you if you win. If not, please put your e-mail in your comment. Winner will be announced November 1st and I MUST have your info then. I'm a fan of WtP on FB. I'm Kanga: caring, loving & nuturing. Thanks for hosting this giveaway! I love Winnie The Pooh! Admittedly I used to love Spongebob myself but I have to agree. I don't think I will tolerate it so well when my LO gets here in February or when my fiance's daughter visits. She loves Spongebob and my used-to-be childhood favorite makes me get a headache now lol. I love tigger, he's so fun! Took the personality quiz I got tigger LOL :D Hope i win Kaitlyn LOVES winnie the pooh!! I am a WTP fan on FB. I've always been an Eeoyre fan, to the point where my in laws buy me everything Eeoyre. It's kind of creepy, actually. Eeyore is my favorite. I just love him! I became a fan of WtP on FB! And I just liked WtP on FB. Took the quiz and got Owl! Yes I maybe in my 20's but I have been waiting to see this movie!! Eeyore is by far my favorite becuase really how can you not love that sad, moppy, little donky! Also whenever my boyfriend is having a bad day I say "Damn it Eeyore put your tail back on!" I have never entered a give away but I could not pass up on this one! Tigger has always been my favorite!!! I've always liked Eeyore, though I also have a soft spot in my heart to Piglet. Just took the quiz and I got Tigger!! Guess we were meant to be! The personality test said I'm Tigger. And I just became a fan of the facebook page!! I'm a fan of Winnie the Pooh on Facebook! I always had a soft spot for Winnie the Pooh. He is such a pure hearted bumbling character. I took the quiz and got Tigger. I am Rabbit on the personality quiz. I have like'd Winnie the Pooh on Facebook. I loved this movie. Pooh is my favorite. My favorite character is Piglet. So cute! I took the quiz and I'm Piglet. Seems fitting, since he's my favorite character! I'm a fan of Pooh on fb! I'm a huge fan of that old blue donkey, myself! I'd love to win this for my girlies - EVERYONE should grow up with Winnie the Pooh! My favorite is Pooh. He's the least annoying and most loveable. I'm officially a fan of Winnie the Pooh on Facebook! The quiz says I'm like Piglet. My favorite character has always been Eeyore. I was a horse crazy girl growing up, so naturally I'm drawn to the donkey. Roo comes in as my second favorite. When I take the personality quiz, my result is Kanga. My favorite character has always been Piglet. Maybe because I was shy growing up. I had a stuffed piglet and my daughter was Piglet for Halloween. I got Tiger when I took the quiz and well I guess that could be right yet for some reason just doesn't feel right. I might have to try again but you know you can't aruge with an internet quiz! Eeyore has always been my fave! i got Tigger: Energetic and exuberant, you're the life of the party! You have an unrivaled zest for life, and though you sometimes act impulsively, your friends know you have their best intentions at heart. I am Piglet, Helpful, Resourceful, and a team player. I would love to enter. My mom took my kids to the movie and I didn't get to see it. My favorite character is Pooh because I had a stuffed animal Pooh when I was a child and I have very fond memories of him. I took the quiz and I am Rabbit. I am a FB fan of Winnie the Pooh. hmm the widget says I am owl. As a child, Eeyore was always my favorite. The widget says I'm Rabbit, which is rather ironic, considering he's one of my least favorite characters, haha. I love Tigger. He reminds me of one of my children. The widget says I'm a Tigger, but I'm probabaly more of a Piglet. A bit of a worrier. I've always loved Eeyore. I had a million ceramic Eeyores, beanie Eeyores, stuffed Eeyores, books with Eeyore...it was a bit crazy. :) But he is super cute. My favorite character is definitely Tigger! I like that he's so bouncy and fun. I'd like to think that my personality is like that, although I do admit I don't have nearly the energy I did 10 years ago! !